Finding a new president, 1945. 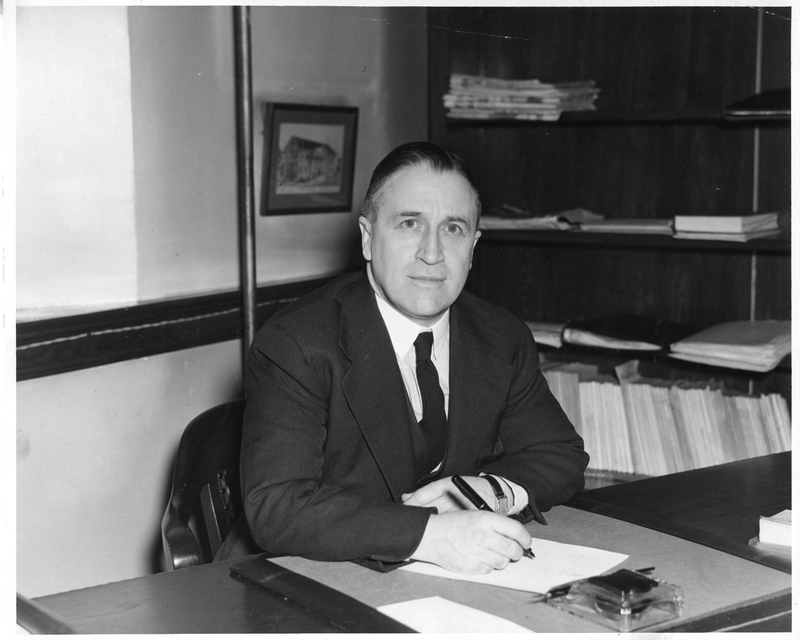 Dean of arts and science, George E. Wilson. Second World War veterans and their influence. Dalhousie’s space problems. Erecting the Arts and Administration Building. Trying to get and keep good professors. Board and president, powers and boundaries. A Faculty of Graduate Studies, 1949. "If the papers surrounding the appointment of Carleton Stanley in 1931 are thin, those on the appointment of his successor in 1945 are almost non-existent. The board struck a small committee in February 1945 to gather information about a new president. Then there is silence. That may have been owing to a dearth of candidates. Was R.B. Bennett’s prediction right: how will you find a competent man to be Dalhousie president? Warren Publicover, past president of the Dalhousie Club of New York, asked, 'What kind of a spineless boot-licker do they expect to put in the office - I can only think of someone like — who is Heepish enough to take the job.' The Uriah Heep candidate was not identified. Stanley had said the same to the board on 23 January: 'What sort of a rubber stamp do they think the President of a University should be?' The board was not looking for a rubber stamp; nevertheless, a university that fires its president cannot avoid a consequent reputation. The Stanley affair was known far and wide, and it did Dalhousie no good. It was also expensive. It cost the Board $5,000 a year, the income for a professorship, just for Stanley’s pension. "Stanley and his family moved slowly out of the big presidential house, selling pictures, furniture, rugs, chunks of his vast library as they went. He had no idea where they were going other than to their cottage on St. Margaret’s Bay. He had been offered a temporary appointment at United College, Winnipeg, to replace Arthur Phelps in English, on sabbatical, but it carried a mighty teaching load of sixteen to eighteen hours a week. Stanley declined that in May 1945, but he accepted another offer a few months later. He was to be a professor at United College until he retired to Uxbridge, Ontario in 1953. "While it searched for a president, the Dalhousie Board of Governors was in a mode now called damage control. The full board was given little information; thirty-three people (together with wives or husbands) do not easily keep secrets. The nominating committee and the executive kept close the names of candidates. A meeting of the full board was called for May, it was presumed to meet a candidate, and then abruptly cancelled. This candidate was one the board was serious about, and whom it brought to Halifax: Dr. James Doull (BA '11, MD '14), director of preventive medicine and public health at Western Reserve University, Cleveland..."